Senior Portraits are taking place between now and January! Contact NowandForeverStudio.com (408) 354-8660 soon! Every year, the yearbook staff sets aside a portion of the yearbook for Senior Baby Ads. These ads allow parents of seniors to honor their child and send them a supporting message. Graduation from high school is a noteworthy step in every child’s life that surely makes every parent proud. 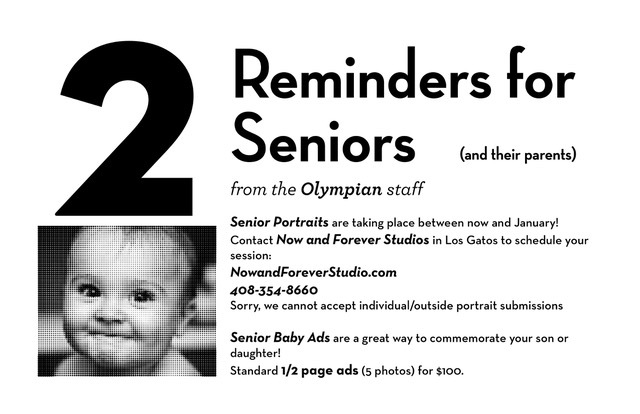 As a long-standing tradition at Gunn, these Senior Baby Ads help celebrate this monumental achievement. Due date Friday, Oct. 27!